Complete Guide to Buying Panel Track Blinds | BlindsOnLine.com - BlindsOnLine.com Inc.
Panel track blinds were first inspired by Japanese sliding shoji screens and their unique ability to conserve space in the home. Instead of having to open and close a swinging door, residents would just slip in and out from room to room without disturbing any furniture in close proximity. 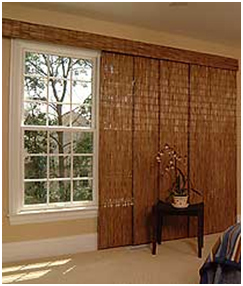 However, unlike the shoji screens, panel track blinds are mostly used as stylish coverings for windows but they can also function as room dividers, patio doors, and sliding doors as well. At BlindsOnLine.com, we have recently added several new panel track products, including sun screen panel blinds. These sliding panels are designed to prevent harmful UV rays and glare from entering the home, without sacrificing the view. 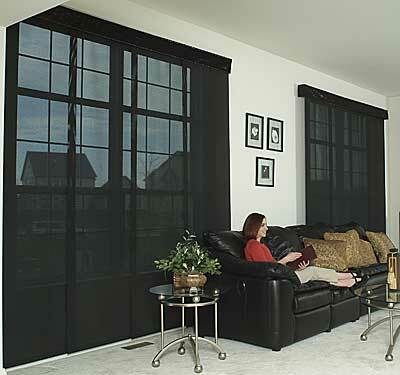 There are many reasons why so many people are now choosing to install track blinds. As we mentioned earlier, panel track blinds are very versatile in their nature and can be used to perform a number of useful functions. Additionally, prior to installing your track blind you will also have the option to decide which direction the panes will stack in when the door is open. Panel track blinds do not collect much dust and as a result they require little maintenance and cleaning. When it is finally time to clean your treatment, be sure to use a handheld, low power vacuum and/or a wipe for any dirty finger stains. Styles come and go but if you want to keep your home looking modern it might be a worthwhile idea to consider these sophisticated-, yet simple-, looking sliding doors. Although panel track blinds are a relatively new addition to the window covering scene, they have already taken it by storm. Track blinds are not only trendy, but will also integrate well with any room’s décor because they come in a wide range of different colors (from white pearl to camel) and materials. 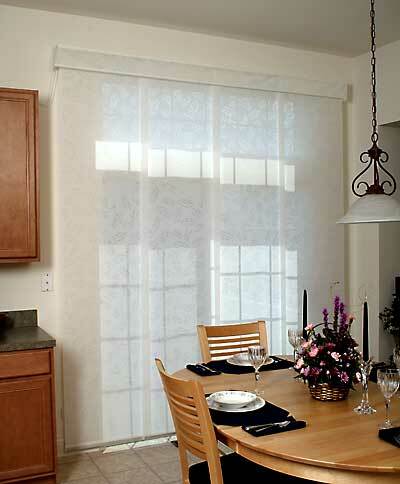 Many window treatments out there are operated by a cord that could be dangerous in the hands of a child; panel track blinds, on the other hand, use a wheel-sliding system, and never a cord, to open and close. Because these blinds work by sliding on a track, they are less likely to break down than other window covering options and less breakage means less replacement costs. Even if your track slide does break down it is easy and inexpensive to fix it. If you decide to purchase panel track blinds from BlindsOnLine.com, you will be able to do so at a discount because we provide you with all the tools you need to succeed, but the installation is up to you. Although homeowners can often install window treatments with the help of the internet, track blinds are a little bit harder to install because they are so big. Like typical treatments, sliding doors are mounted onto brackets; however they also have a track. Oftentimes, these tracks will be weighed down to ensure optimal performance.